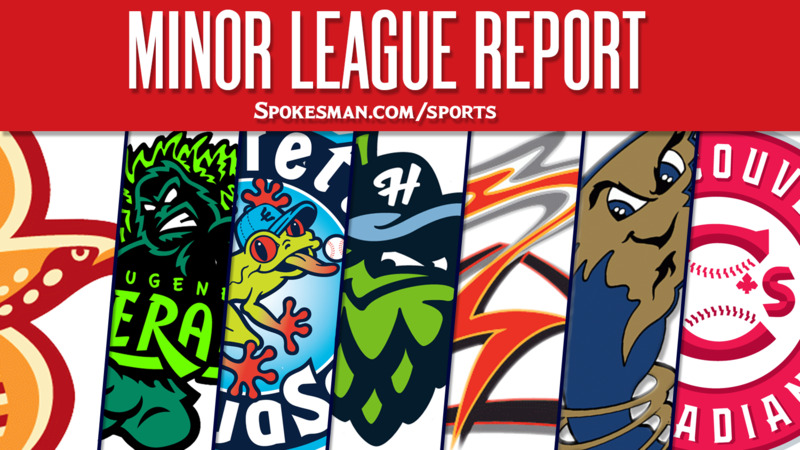 Spokane 2, Hillsboro 1: Hans Crouse struck out six over fine innings and allowed one run on four hits and two walks and the Indians (5-3) edged the visiting Hops (5-3) in the finale of a five-game series. Vancouver 6, Eugene 3: Brandon Polizzi had three hits, two stolen bases and an RBI and the Canadians (5-3) beat the visiting Emeralds (3-5). Griffin Conine went 2 for 3 with an RBI and a pair of doubles for Vancouver. Everett 12, Salem-Keizer 6: Nick Rodriguez went 3 for 5 with four RBIs and the visiting AquaSox (4-4) handled the Volcanoes (4-4). Everett had three players with three hits as the team pounded out 19 against four S-K pitchers. Connor Kopach drove in three runs for Everett with three hits, including a double and triple. Tri-City 4, Boise 1: Sam Keating allowed one run on two hits and two walks with five strikeouts over 5.1 innings and the visiting Dust Devils (4-4) beat the Hawks (2-6). Dwanya Williams-Sutton went 2 for 2 with two RBIs for T-C.
Reno 3, Round Rock (AAA) 2: Off. RHP Jeffrey Springs (28): Promoted to Texas. Frisco (AA) 6, Midland 5: Chuck Moorman went 3 for 4 with two RBIs and the visiting RoughRiders (46-63) edged the RockHounds (47-61). Preston Beck and Luis Mendez had three hits apiece for Frisco. Myrtle Beach 10, Down East (High-A) 7: Andruw Monasterio went 3 for 5 with a grand slam and the Pelican (50-58) beat the visiting Wood Ducks (46-63). LeDarious Clark had a solo homer, Yanio Perez went 3 for 5 with a run while Andretty Cordero drove in a pair for Down East. Starter Joe Palumbo was roughed up for seven runs, but just two were earned. Hickory (Low-A) 7, Charleston 3: Sam Huff went 2 for 4 with two home runs and five RBIs and the Crawdads (52-54) beat the visiting RiverDogs (50-55). Huff hit a grand slam in the first inning and added a solo shot. Yonny Hernandez and Tyreque Reed also homered for Hickory. Published: Aug. 1, 2018, 5:55 a.m.